There are two methods for connecting idibu and Twitter for job posting. 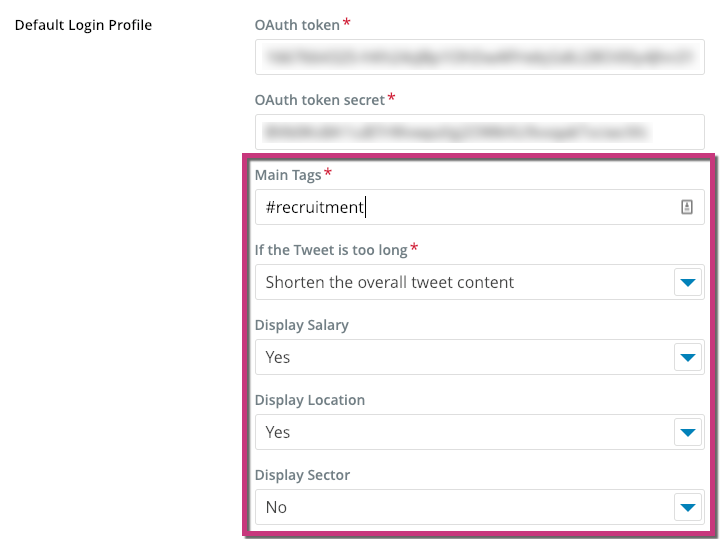 In this article we are going to walk you through connecting Twitter in the job board settings area. If you or a colleague prefer to connect your account during posting, take a look at this article. We'd generally only advise this if a user needs to connect their own personal account, or a company account they have access to, and will be the only user posting to it. However, we've provided some thoughts to consider before setting up your Twitter account(s) with idibu in the next section. In most cases, we find clients prefer just to connect one single company account to Twitter - but there is no reason why users can't connect and post to their own Twitter account as well, if that is required or preferred. For example, if they have a personal account they use for professional purposes and a strong following of candidates. 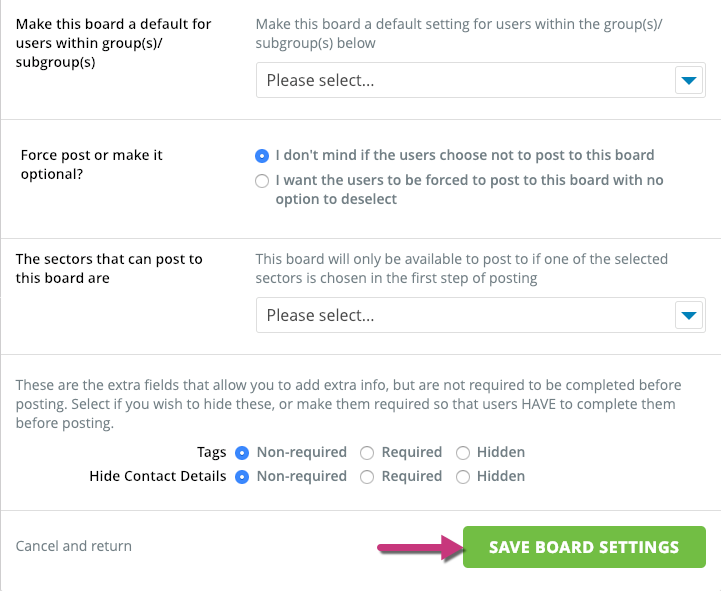 Another scenario might be that you have several professional accounts for different business areas, and so want to allocate those to different users or groups/subgroups which can easily be done in the board settings area. It's also worth considering, particularly with your business account(s), whether this is a tool you should allocate to a single or selective group of users rather than everyone in your idibu account. We mention this because research has shown that over-posting advert content to Twitter can have an adverse affect on your Twitter following. In other words, you want to ensure you control your Twitter feed so you provide a good blend of content for your followers; good informative content that is of interest to your target candidates, peppered with selected vacancy adverts that enhance your brand. This is the recommended path for connecting either a single company account, or several company accounts to different users, groups or subgroups. We recommend this because it negates the need for you to share professional twitter account logins with users who otherwise do not need access to the account(s). 1. Go to 'settings' and click on 'Board subscriptions'. 2. If you don't see Twitter in your list of subscribed boards, then type Twitter into the board search field and select it from the drop down list. 3. 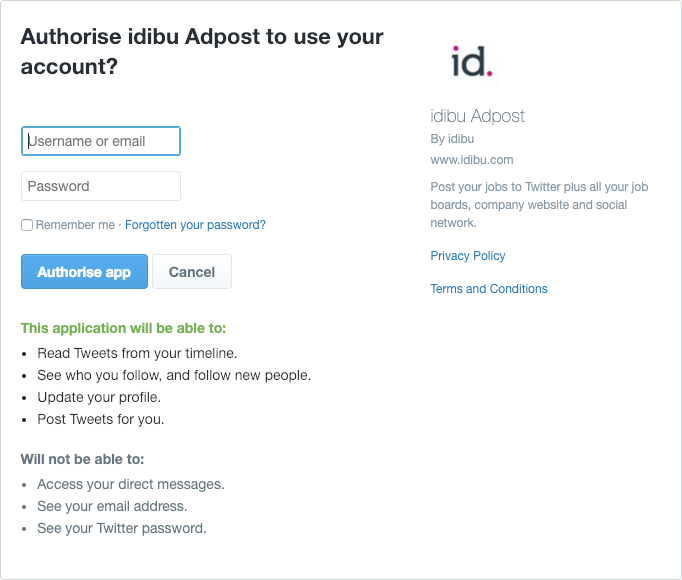 As you are taken into the Twitter board settings area, you will see a pop up appear explaining how you obtain your OAuth tokens to connect and authorise your Twitter account for use with idibu. Click the link now to open this in a new tab. 4. If you don't see the pop up, or have closed it, then don't worry - simply click 'view more' at the top of the page to open up these details and access the link again. 4. 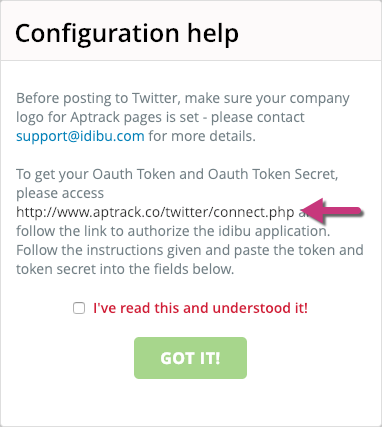 Having clicked the link, you will see the idibu Twitter OAuth page open on a new tab. Click where it says 'Click here' to begin the authorisation and connection process. 5. You will be taken to the idibu authorisation page. All you need to do here is input the username or email, and password of the Twitter account you wish to connect. 6. 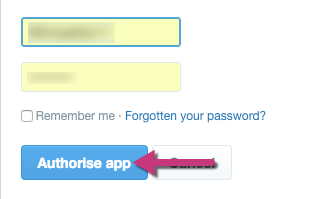 When you've typed these in, click 'Authorise app'. 7. 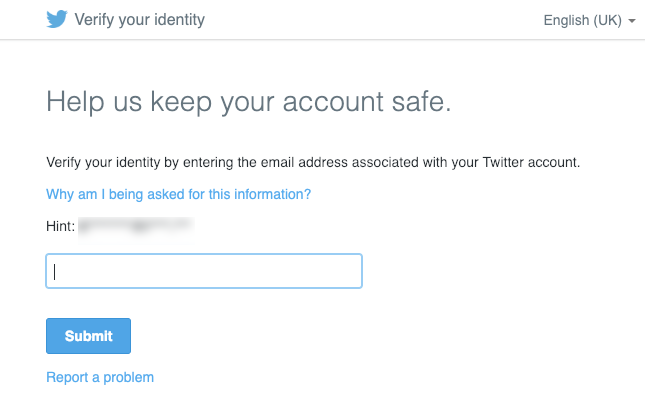 If you typed in the username of the account in the previous step, you may be asked to also verify the email address for the Twitter account. Type this in then click 'Submit'. 8. 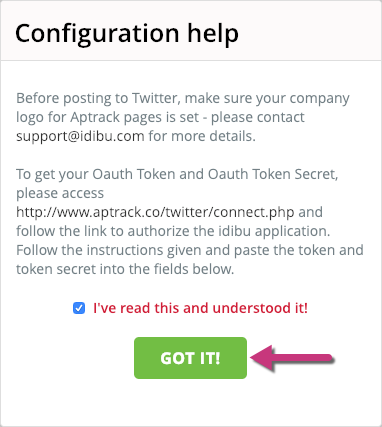 You will now be taken to the idibu Twitter OAuth page. Here you will see two long codes in bold type marked 'OAuth token' and 'OAuth token secret'. 9. You can copy each of these directly into the idibu settings, but you might find it easiest to copy and paste them into word, notepad or something similar first. 10. 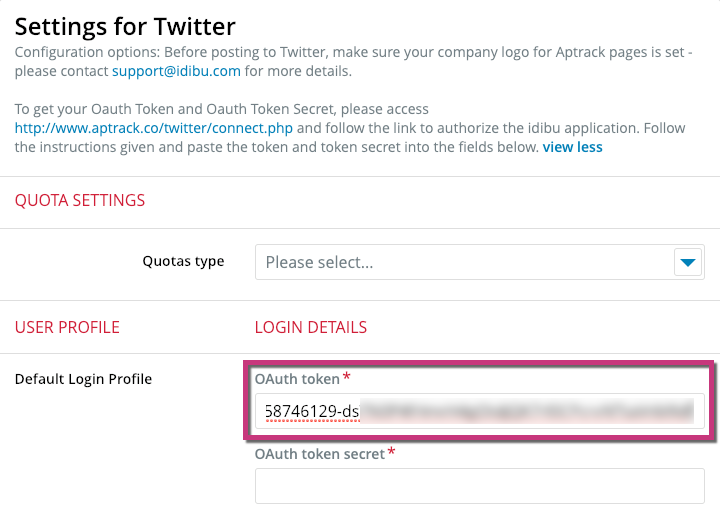 Paste the 'OAuth token code' into the field marked 'OAuth token'. 11. Paste the 'OAuth token secret' code into the field marked 'OAuth token secret'. IMPORTANT - ensure you copy each code into the correct field, otherwise your accounts will not connect. ...or even a specific user. 13. In the settings area at the top of the page, you can specify default tag(s), and other parameters for the content of the tweet. 14. You will also find the usual job board setting parameters at the bottom of the page, tailored for Twitter. When you are ready, click 'Save settings'.